Can Food Affect Your Mood? Yes! | Gastrointestinal Specialists, Inc.
Food can affect your mood in a few different ways and knowing how can help you feel better day to day. Luckily, food that makes you feel good is food that is good for you. Indulgences feel good in the moment, but are typically followed by a feeling of bloat, tiredness, or even guilt. 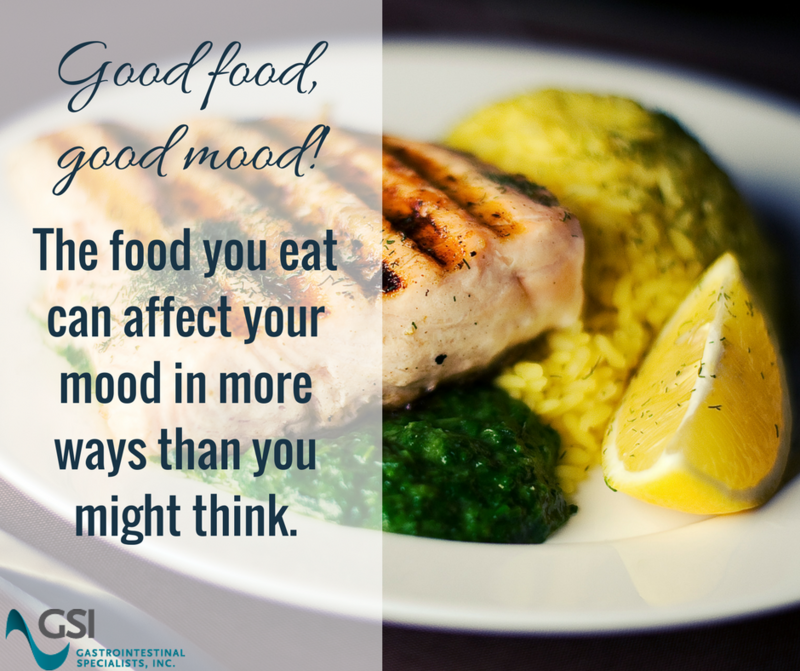 Here are ways that food can positively and negatively impact your mood. Obviously, it can be difficult to be in a good mood when you don’t feel well. So it makes sense that eating foods that hurt your stomach or cause heartburn, bloating, or diarrhea, will negatively impact your mood. Take your time eating to avoid uncomfortable heartburn and bloating. Heartburn and bloating are most easily caused by overeating, so it’s important to eat slowly, and to save what you don’t finish instead of overeating just to clear your plate. Avoid overindulging in alcohol and coffee. Coffee and alcohol are common triggers of heartburn. When consumed in excess, both beverages tend to cause crashes. When you first drink coffee or alcohol you get an enjoyable buzz, but it will soon be followed by a crash, characterized by lethargy and headaches. Refined sugars such as soda, fruit juice, or candy cause your blood sugar levels to go through the roof, causing a short-lived burst of energy, followed by a crash that will leave you more tired than before, so try to avoid unnecessary sugar. Get your vitamins and minerals. Folate and vitamin B12 can help to fight against depression. Make sure you get these nutrients. Foods rich in soluble fiber have been shown to increase levels of serotonin, the ‘feel-good’ neurotransmitter, which keeps you from having mood swings. To avoid mood swings and fatigue, try to eat modestly sized meals without refined sugar, and avoid overindulging in coffee and alcohol. Your body and your mood will thank you!